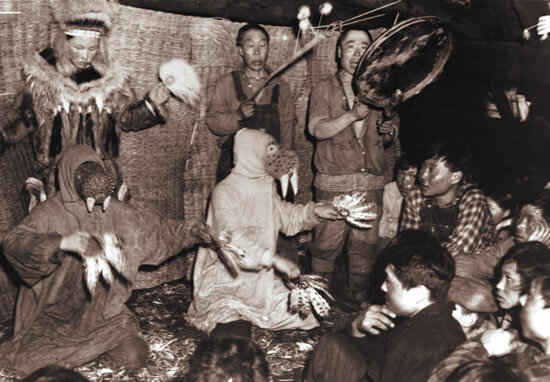 Pair of masked dancers performing in Qissunaq, 1946. Malruulutek kegginaquk akiqlirraqlutek; cimirtaarturluteng. Tuaten piureluteng, taungunguarturluteng aperluku kaigaluteng. Canguat tamakut apalluqureluki tua i kiaku amlleresqelluki. People took turns presenting masks in pairs side by side. They used animals depicted on the masks as apallut [verses] in hopes that the animals would be plentiful in the summer. Elders tell us that each dance song consists of both a chorus and two or three apallut (verses), which the masked dancers enacted. Masks appeared in pairs and trios because the songs they dramatized had two and three verses. No single meaning underlies the paired masks. Some highlight opposites--ocean and land, day and night, male and female. Others emphasized similarities. Most masks in museums probably were once paired, but we no longer know their songs and stories and so cannot recognize their partners. 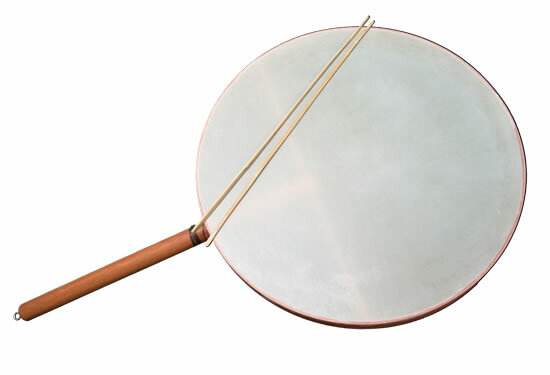 Drum like many used today, covered with airplane fabric. Made by Moses Wassilie of Bethel and Anchorage in 2007. 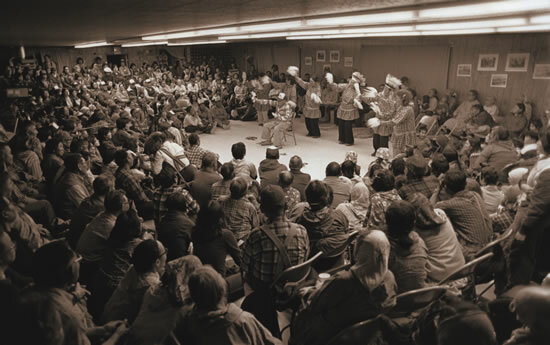 Chevak dancers led by Joe Friday perform in the new St. Marys community hall during the first Yupiit Yuraryarait (Yup'ik Ways of Dancing) in 1982.